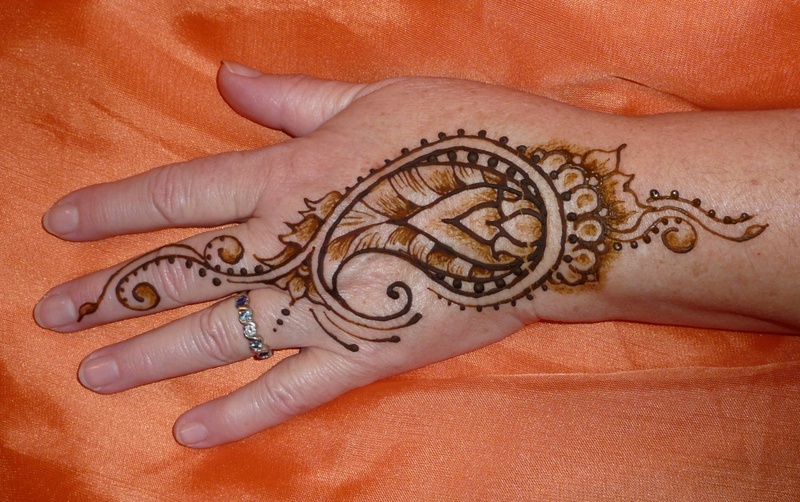 Mehendi is a shrub whose leaves are used to make henna. The leaves are dried, and then ground and made into a fine paste. This paste is then filled in a cone and is used by women to decorate their hands and feet. Traditional mehendi designs are representations of the sun and they include motifs and patterns including flowers, leaves, peacocks and other symbols of prosperity. It is also believed that storing mehendi for a long time will give a better colour. This age-old art is available in Pakistani, Arabic, Rajasthani and Marwari forms and the designs offered by each of them are distinct and unique. 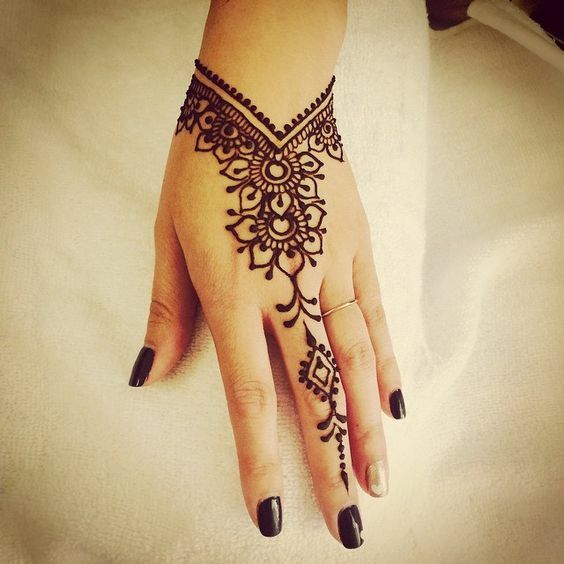 Mehendi is immensely popular among women in the Middle East and India. 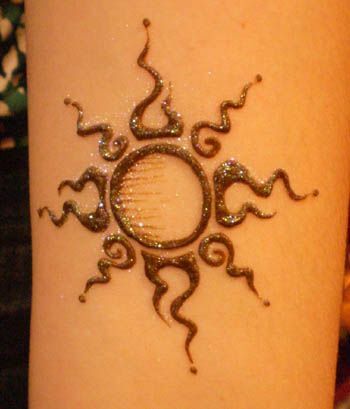 However, it is attaining immense popularity in western countries as temporary tattoos. If you are the kinds who love decorating your hands and feet with this art but find it to be a time-consuming art, then look no further than this article. 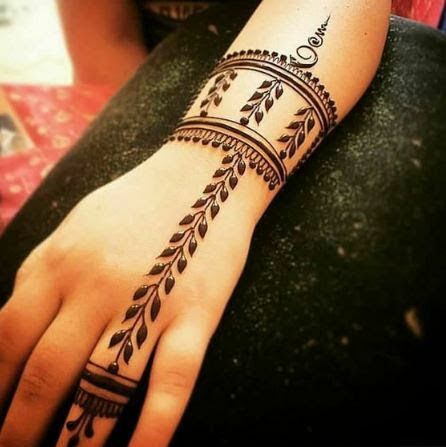 We have come up with a list of some of the most simple and easiest mehendi designs which you can draw yourself in the shortest possible time. 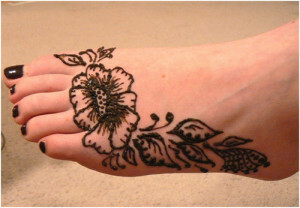 You do not need any Mehendi artist for the same as hiring one can be time-consuming and expensive! Read on to know more about these 40 exclusive yet simple mehendi designs that you can draw at home! 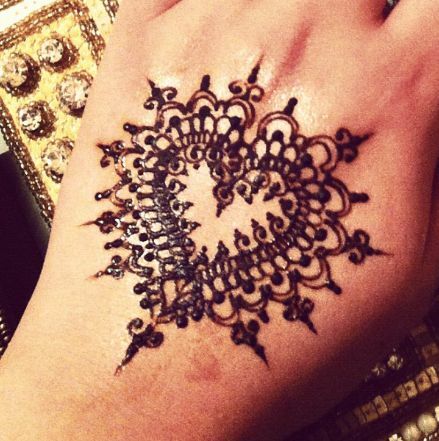 If are a henna lover and you like to keep your henna design simplistic then this design is simply perfect. This pattern is perfect for all ages and you can add a few more flowers to make it a full-fledged design. 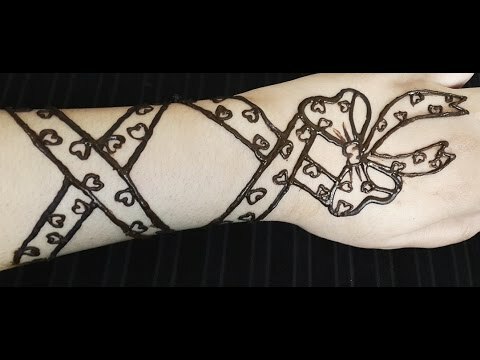 This mehendi design looks like a harness bracelet. It is the perfect amalgamation of a modern and traditional design and it can be easily done at home. Start by drawing the V-shaped design and then proceed to draw the flowers. 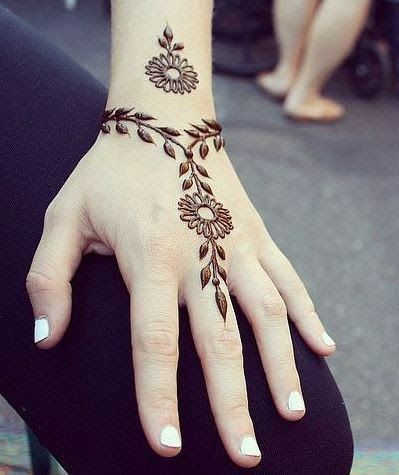 This Mehendi design is easy yet beautiful. You just have to work towards making small flowers together. Focus on filling a few of them to give it a shading effect. Perfect design for beginners. 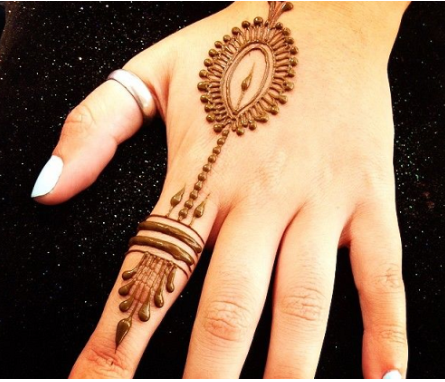 This mehendi design looks like a hand ornament and it is an It extremely simple design. The net detailing on the fingers are extremely simple to draw and it adds to the beauty of the design. 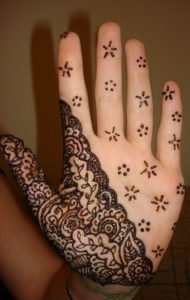 If you want a mehendi design that looks good with western and Indian clothes, then try this design. This is a simple overlap of leafy strands which cannot go wrong. This is the best for beginners as well. 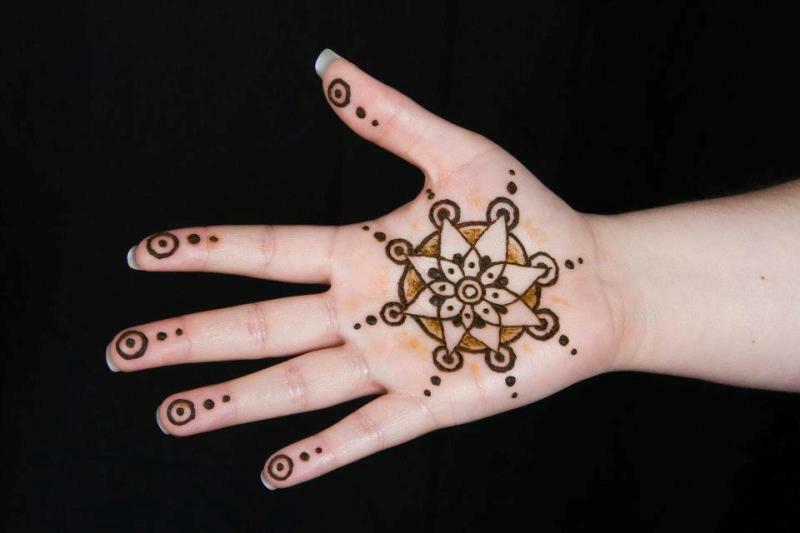 This is another easy mehendi design that you can draw at home. This is perfect for engagement day where you want the focus to be on your finger. If you do not like something too heavy but you wish to look different on your engagement ceremony, then this is the best design. You can make this design on any finger but it is best when it is done on your ring finger. 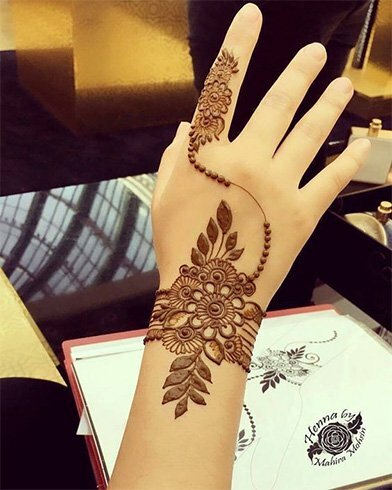 If you are looking for a mehendi design which is perfect for engagements or sangeets, then this is the best design for you. This design is not too over the top and it will suit people of all ages. 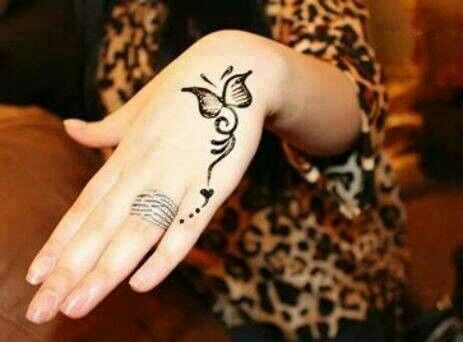 This backhand Arabic mehendi design can be drawn on your palm as well. It has a heavy foliage of leaves which are shaded thickly for that Arabic effect. Simple to draw yet it looks very royal. This is a minimal looking design that is quite different to look at. It is perfect for those who do not like to apply heavy mehendi. 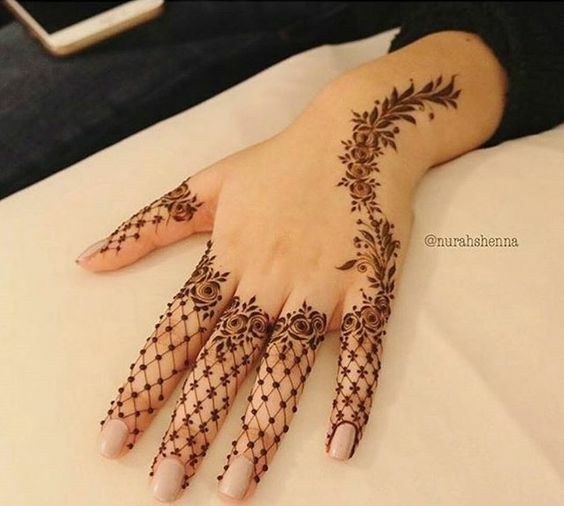 This unique design is the best for a modern woman who wants her henna to look trendy and traditional. This is a stunning and different design that focuses on the index finger and thumb. The rest of the hand remains plain except for small detailing at the tips of the fingers. This design just has a flower in the centre with a few leaves all around. You do not have to fill up the fingers as they can be left blank. If you wish to, you can shade the leaves for a more dramatic effect. 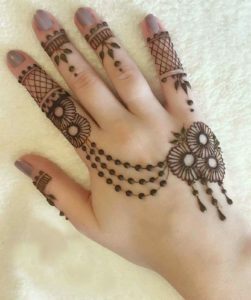 If you are an office going or college going person who wants to keep everything simple then this finger detailing mehendi design is the one for you. With intricate detailing near the fingertips, this design makes the fingers stand out. 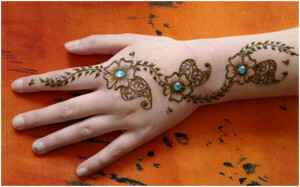 One of the latest concepts in Mehendi designing is the use of glitters and stones. This design has been highlighted with blue stones. When they are fused with traditional designs, they look attractive. Draw three flowers and use blue stones in the centres to make them look bright. 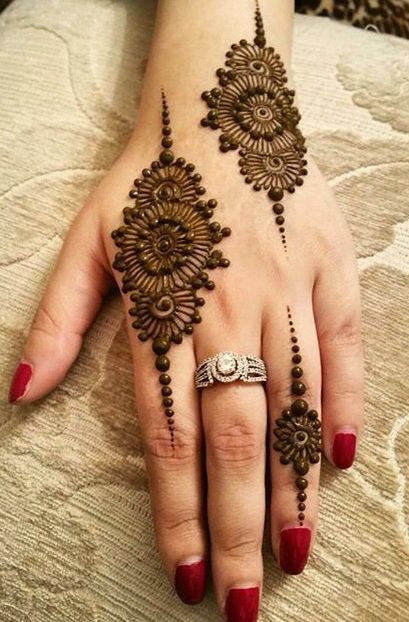 This is a contemporary looking Arabic style design that has net detailing and floral motifs all over your hand. Small flowers and fine crisscross patterns give it a minimalistic look. This design looks like a feet tattoo design. This is simple design for your feet which has a medium difficulty level. You can draw a large flower in the centre and then branch out leaves from the sides. You can show it off by wearing a pair of flip-flops. This design looks like the person is wearing a pair of anklets. 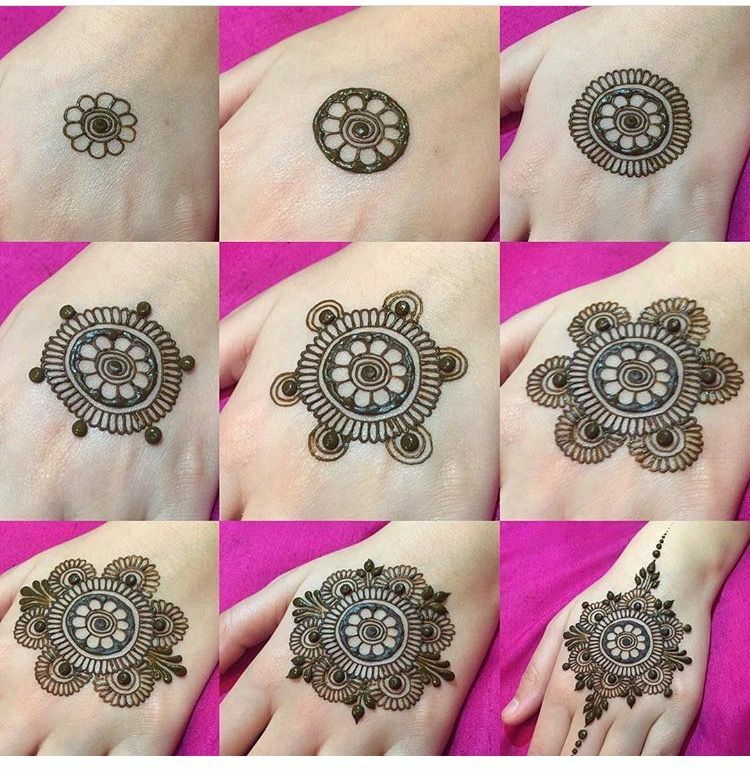 This design is extremely easy to make for beginners and experienced mehendi lovers alike. 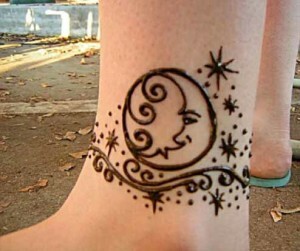 It involves the use of dots to draw anklet like designs on your feet. 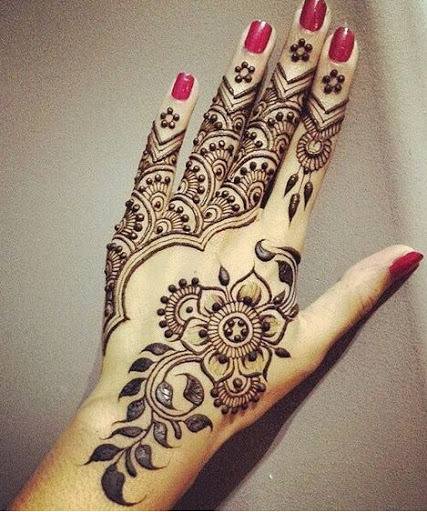 This is an extremely modern pattern that has been imbibed into mehendi art. You need to keep this design sharp and its lines neat and distinctive. Angles are extremely important in this design and you need to make a bracelet at the wrist from which the lines will branch out. 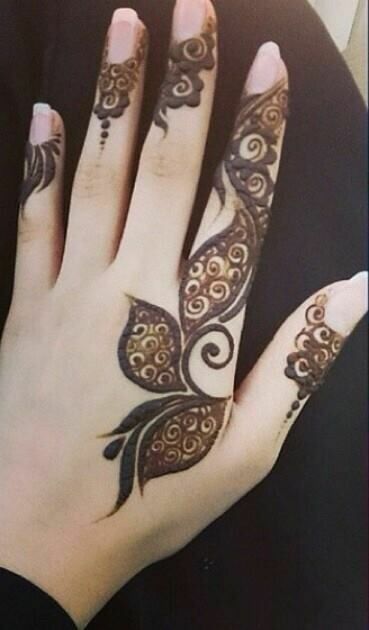 This simple design looks like you are wearing a hand ornament. Simple flowers and leaf patterns have been used to create this design. A leafy string is adjoined to the floral motif created in the centre. This unique design divides the hand into two. 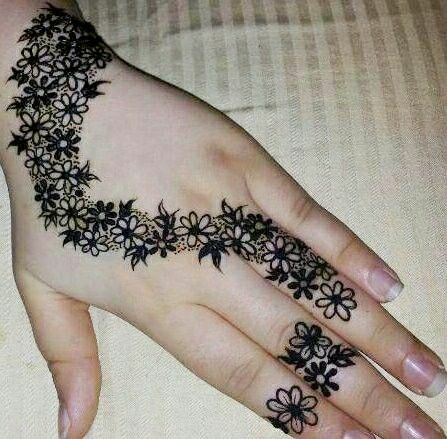 One half of the hand is covered by flowers and leaves and the second half has a lot of empty space with a few stars drawn at equal distances. This design has been drawn using lines. 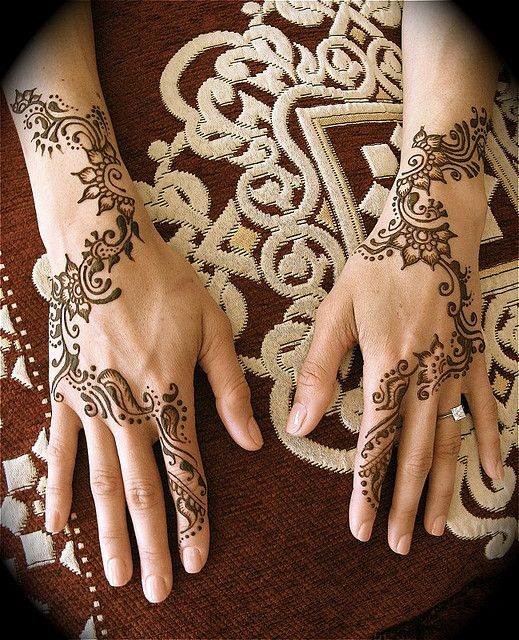 It is a no-brainer design which looks quite different when compared to typical henna designs. In the centre of the hand, triangular shapes have been drawn and lines branch out from them. This is a stunning abstract looking design we must say! This is a traditional mehendi design that makes use of flowers leaves and other typical motifs. It is suitable for people of all ages and it has standard patterns. The leaves are shaded which give the design a rich effect. 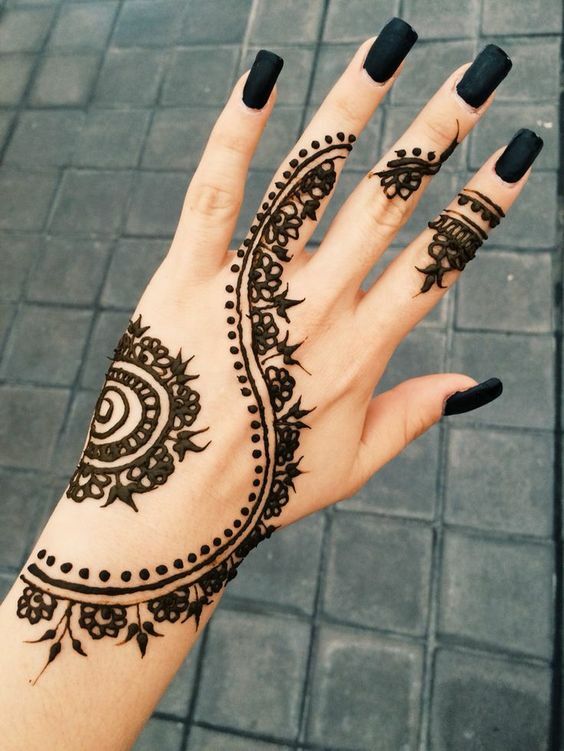 This is a normal mehendi design but its placement makes a difference. It covers one side of the palm which gives it a distinctive look! 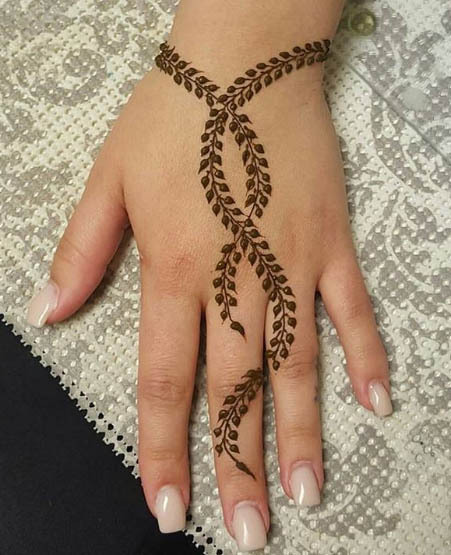 This a normal floral strand design with three big flowers in the centre and leaves all around. This stretches throughout the palm and its clean design makes your hand looks full but this is very simple to draw. 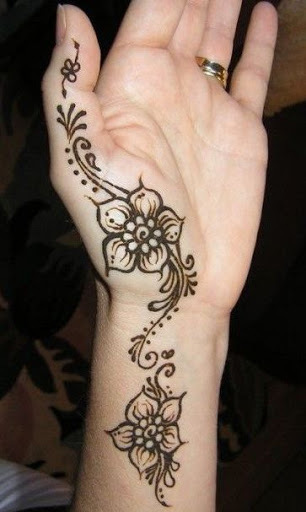 This is a mehndi design for young people who like the tattoo effect instead of a conventional mehendi design. All you need to do is draw a big leaf across your hand and shade it well. 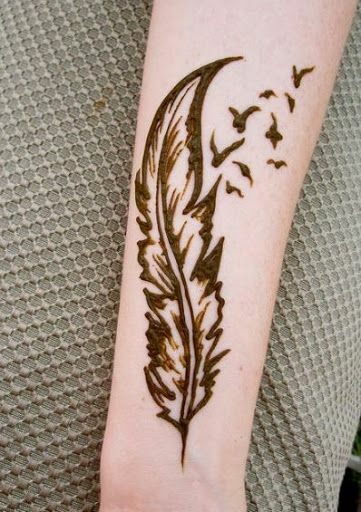 Draw a few flying birds alongside to give it that artistic effect. 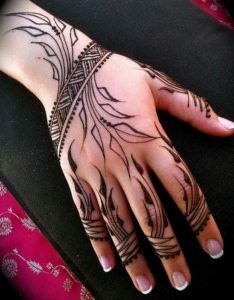 This is another tattoo like a design for youngsters who do not want to sport conventional mehendi designs. Simple to draw, this butterfly design gives a chic appearance and is most suitable to go with a western appearance. If you wish to make your feet look prettier then this design is your best bet. Draw two simple feather leaves which are simple and can be drawn in a few minutes. You can extend this design by adding more leaves to it. This easy design can be created on your wrist, ankle or back and is the easiest design. You can increase or decrease the size according to your liking. You can add some glitter to add that blingy touch. This paisley shaped design is simple yet very artistic. You can extend the pattern around it to make it look elaborate. This is a sophisticated design can be carried with both ethnic and western outfits. This design looks extremely simple yet elegant. 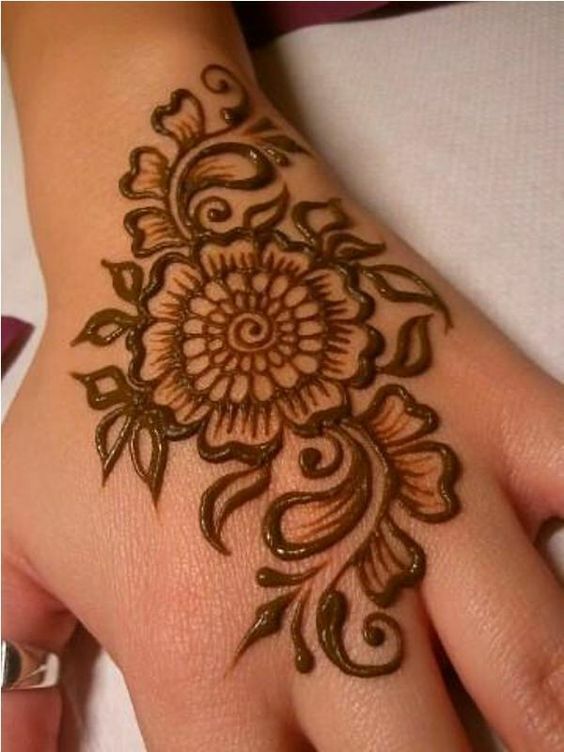 A central floral mandala is created in the centre and the fingers have been embellished with some basic detailing. 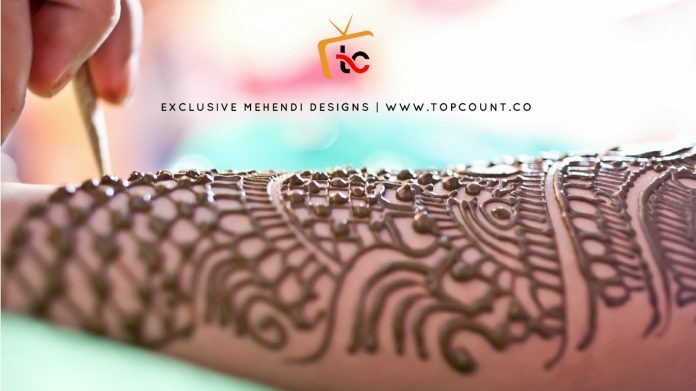 A zigzag floral pattern has been created here in this mehendi design. Along with the flowers, paisleys and other motifs have also been used. The look has been completed with the use of dots and circular patterns. This is one of the easiest designs even children can create. This centre of attraction of this design is the chakra which covers the palm entirely. Circular patterns and dots have been used to it to create an attractive design. This back tattoo mehendi design looks very modern yet beautiful. 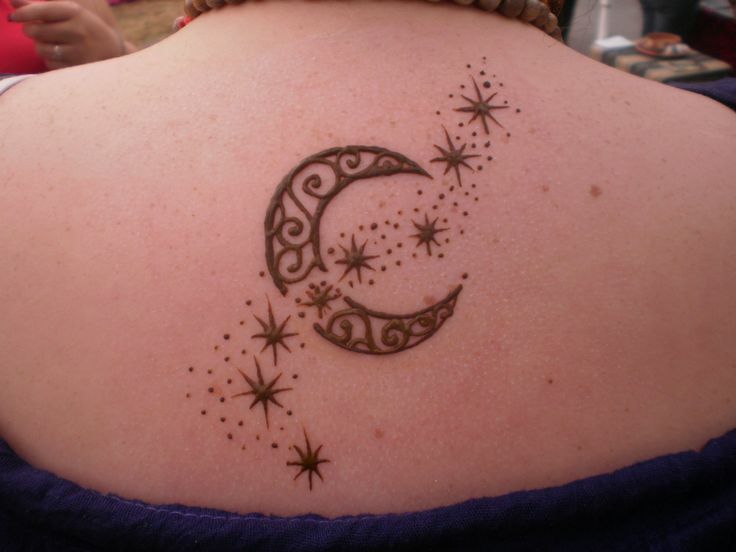 Comprising of the half moon and a sprinkling of stars is sure to make your back look attractive. Easy to draw, this can also be drawn near the wrists. 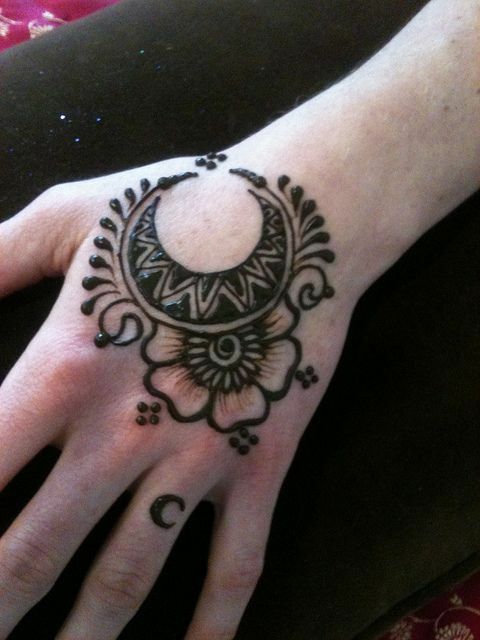 This is an artistic mehendi design which requires drawing a complete circle and a half moon with a face on it. 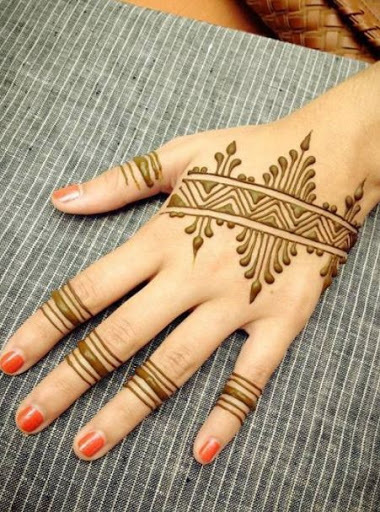 You can add a few stars, dots and soft wavy lines to complete the look of this mehendi tattoo. This intricate mehendi design has a cuff bracelet drawn over your wrist and a leafy pattern along with it that extends in a straight line towards the ring finger. The pattern drawn on the ring finger is that of a ring which makes this another perfect engagement design. This backhand paisley design comprises of floral patterns along with a huge paisley in the centre. The whole design has been lightly shaded to give it an interesting look. The design extends to the middle finger and all the other fingers have been kept blank. 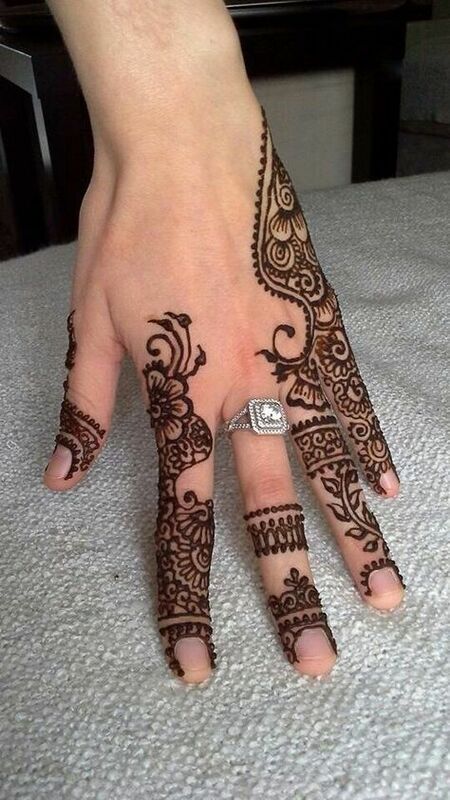 A modern mehendi design that covers only the fingers. It is suitable when you wish to keep your hand empty for wearing other jewellery such as hand bracelet. 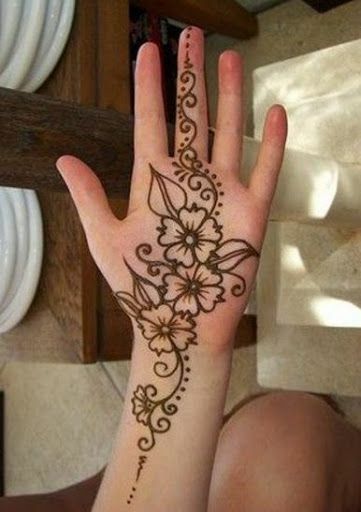 This is best suited for girls those who do not like heavy mehendi designs. This is an out of the box unconventional design that merges a half circle and a flower. The detailing on this design is quite thick which makes creation easy for beginners. Suitable for teenagers and children as well. 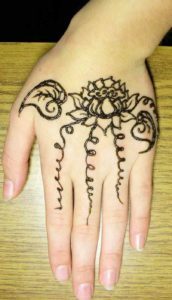 This design involves the creation of lotus flowers in the middle of the hand and vines running along it. You can shade the petals of the lotus flower in the design to give it a more detailed look. The fingers can be kept empty. 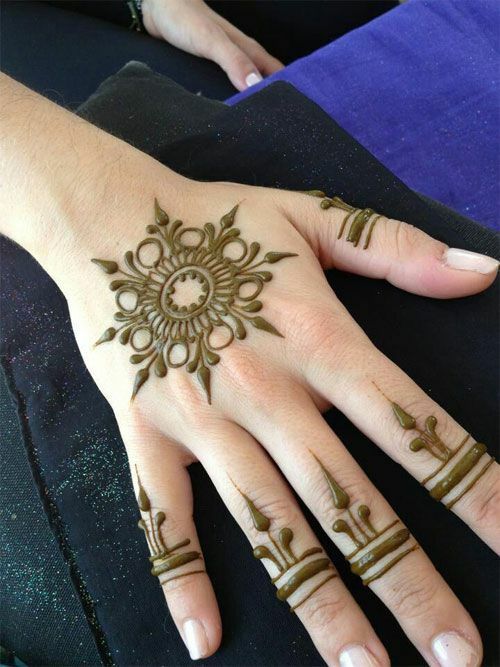 This is a perfectly modern design for those who like exclusive henna designs without too much detailing. This has three floral structures with circular patterns. Two of these structures are located at the back of the hand whereas the third one is placed on the ring finger. A majority of the hand is empty and this can go well with both modern and traditional looks. This is a fun and quirky henna pattern suitable for young girls and children who are fond of bows. It can easily be created by a beginner as it has a criss-cross ribbon-like pattern with small hearts all around it. Why Are Perfumes No More Gender Biased With Unisex Range Of Perfume Collections?